O Trading and stock quotes downloading software for Microsoft Excel. You can download historical end-of-day and real time quotes into spreadsheets. Portfolio, stock options, stock charts, intraday. Powerful stock quotes downloading software for Microsoft Excel. DownloaderXL package includes the following products: DownloaderXL, RTQuotesXL, OptionsXL and PortfolioXL. 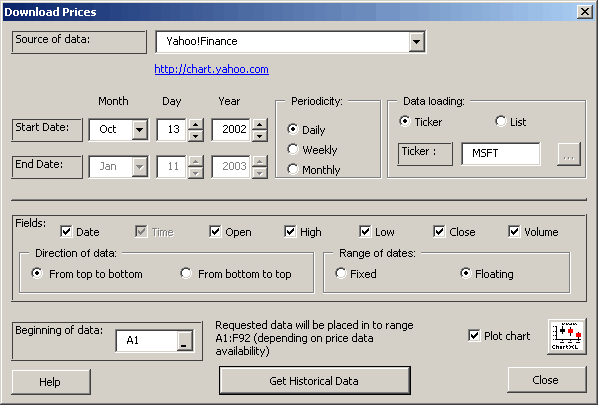 DownloaderXL downloads free historical stock, index and mutual fund data into Microsoft Excel spreadsheets from Yahoo Finance. Historical data goes back at least 15 years and is available for exchanges of USA, Canada, UK, Germany, France, Italy, Australia, New Zealand, India and more countries. DownloaderXL easily builds charts. RTQuotesXL downloads free 15-minutes delayed and fee-based real-time quotes for stocks, indexes, options, mutual funds, financial futures, commodity futures and other securities from Yahoo Finance and PCQuote. DDE feature is accessible. RTQuotesXL can be used for real-time charting, real-time technical analysis and monitoring current market situation. OptionsXL is a option chains and LEAPS series downloader for Microsoft Excel. PortfolioXL is a portfolio tracking add-in for Microsoft Excel. PortfolioXL: - The data can be grouped by tables. - Export Portfolio records into Excel. - Import records into Portfolio from Excel. - Open/Close Short positions. - Exercise/Close derivate. - Transfer records form one portfolio into another. - Split operations. - Download current prices from different data sources. - Download and add dividends. - Adjustable Portfolio settings. OptionsXL: - New data sources: INOOPTIONSLIST PCQUOTE CBOE DDE (dynamic data exchange) - OptionsXL Settings spreadsheet is added. - Master Options feature is added that helps to create the list of options to be downloaded. - Update all/Selective update feature is added.